Observing the signal given by the king, the Portuguese army marched forward. The absence of the delegates of the king and the delay of the Portuguese delegates the next day, made Pinno quite suspicious. 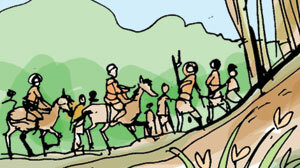 Meanwhile, a few of the mercenary soldiers who were sent earlier had run away from Balana. These soldiers informed Pinno that the conspiracy had been revealed. Thereafter, there were some misunderstandings but no fight took place. King Vimaladharmasuriya left Balana and went to the capital city. Portuguese built fortresses in Denawaka and Seven Korales and strengthened their security. King Vimaladharmasuriya who was passing his time in the capital city, was thinking of a plan to chase away the Portuguese from the country. The king then heard that a naval team from Holland had come to Batticaloa and that they were anxiously waiting to meet the king. This took place in 1602. 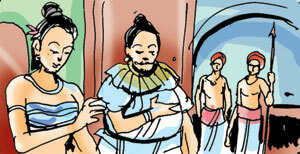 By this time, the Great Mudliyar of Kandy was Manuel Dias. The king sent him to welcome the Dutch and bring them to Kandy. The leader of this Dutch naval team was Joris Van Spilbergen. He is at the time described as a prince. Admiral Spilbergen came to Kandy to meet the king. He promised the king that the Dutch were ready to help the king to chase away the Portuguese. The king was delighted over the fact that he was getting the help of a foreign power, to chase away the enemy, whom he could not defeat with all his plans and battles.